Known in Fiji as Yaqona, it is the roots of this plant that are prized in Fiji. 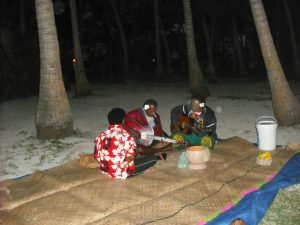 Once reserved for the Chiefs and Elders only, Kava is now used socially by various communities and is always a part of a Sevusevu, the ceremonial request of asking the Chief for the right to visit an island or enjoy the waters around the island. Whether used socially or for an official purpose, the presentation, preparation and serving of Kava is a highly evolved ritual of great dignity, with various aspects of the preparation and presentation passed down through village families for centuries. 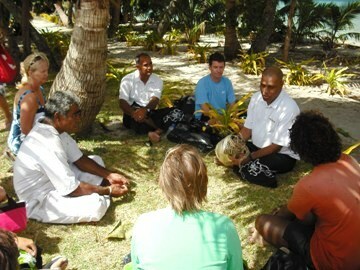 To enjoy a welcoming bowl of Kava from the village basin or “tanoa”, is an age old tradition and part of exploring the local culture of Fiji, while on yacht charter. Kava grows in the wild in Fiji, but is actually quite difficult to grow, requiring lots of rainfall, and careful tending. Kava is considered mature for use when the plant is at least 3 years old. Once harvested, it is the root and lower stems are washed and dried. Once dry, the results are pounded in a container called a “tambili”. This powder is then placed in a cheesecloth sack to strain the bits and pieces and water is poured over the cheesecloth holding the Kava powder into the Kava bowl. The resulting brownish liquid, a mixture of Kava root powder and water, is collected in the tanoa, which can be wooden and highly ornate, or a plastic bowl. Often a half coconut shell is used as the drinking container. To signal your interest in a Kava round clap your hands together , say “Bula” and on receipt of your portion, down the drink in one long swallow. After swallowing the contents, signal the end of your drink by clapping three times, a clap often joined in by others enjoying the Kava bowl for a great sense of camaraderie. Originally, the fresh roots were separated from the rest of the plant and washed. Bits of the root and lower stem were chewed to a pulp and the resulting mash of Kava and saliva was spit into the bowl. Only particular villagers could chew and prepare the Kava pulp, and it was an honor to be a chosen Kava chewer. Drying the root, pulverizing and mixing with water, is the manner all Kava is prepared in Fiji today. The best Kava is felt to come from the roots only, called “waka”. The lesser quality Kava is from the stems of the plant or the “lawena”. However whichever part of the Kava plant supplies the dried powder, Kava is consumed constantly in Fiji, and creates a relaxation of the limbs and often a tingling sensation and numbness in the lips and mouth. Taken in excess, Kava can create a lassitude sometimes referred to as “Kava Head”, and the drinker can develop “kanikani” where the skin develops a reptilian look. However this does require a large excess drinking of Kava over a long period of time. As Kava, just like anything else if taken in excess, can cause an issue. However, having a welcoming bowl or indulging in Kava, while in Fiji, will not turn any visiting charterer into a kanikani, and everyone should have at least one or two bowls of Kava to mark their visit to and explore the culture of this lovely area.